Since 1991 Rainer Ganahl has been learning foreign languages as part of his art practice. Taking Edward Said's critic of Eurocentrism and the nexus of power and knowledge as his departure point, the artist has been mainly focused on Asian language learning, including Japanese, Korean and Chinese but has also studied Arabic and Russian for years. Over his first 15 years of working with language acquisition this eternal student for art's sake refused to include anybody but himself or his study materials in any given visualization as his focus was on learning and not on representing the exotic or not so exotic Other. Only in recent years, he actually broadened his field of representation and re-enters directly the social world with his art works though without losing his original focus – i.e. language learning. For this exhibition Rainer Ganahl presents two new videos that are situated within his spectrum of interest in Mandarin learning as well as in Chinese history and socio-economics. Since Youtube and Vimeo are not available in China, certain crucial historical songs of the Great Cultural Revolution cannot be accessed by Chinese web users. When Ganahl asked his Mandarin teacher and friend Liu Ya-Nan to teach his son Edgar and himself a song from the Great Cultural Revolution - he discovered that the specific song taught by Liu Ya-Nan was nowhere to be found on the internet. Even very informed younger folks - for example the writer Mian Mian - never had heard this song. Only the older people who already as grown up had lived or suffered through the years of 1966 and afterwards remembered this song. to fight the bad ones. think that the party is great. How is business today ? This video was specifically made for this occasion, i.e. 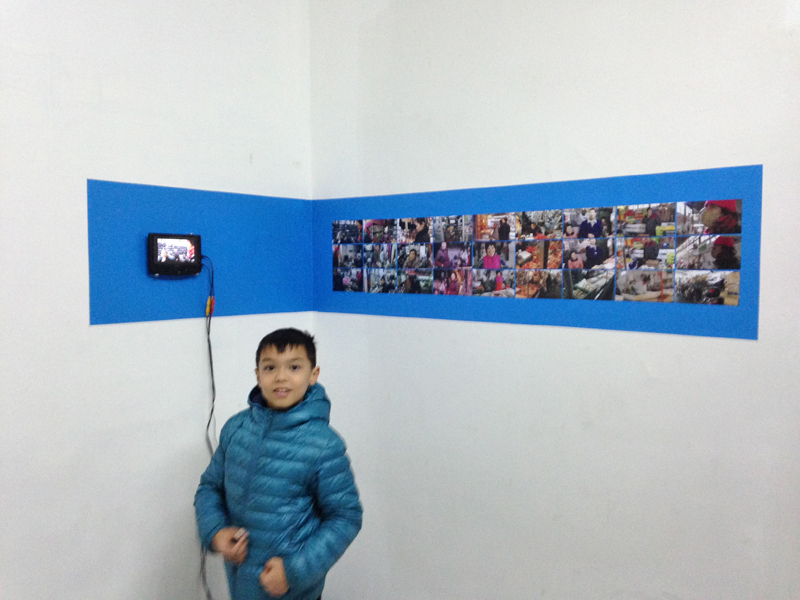 at Xin Hua Market where the Bazaar Compatible Program is located as if it were a regular sales booth. 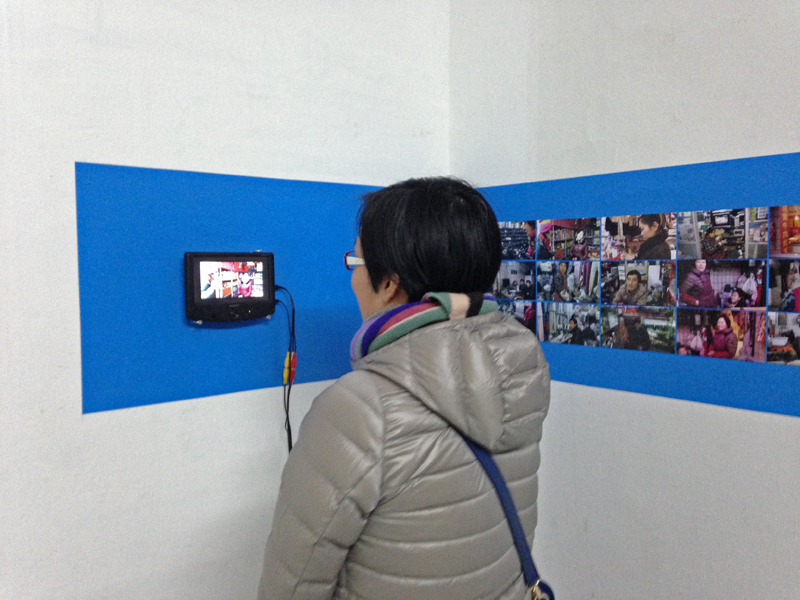 The film consists of over a dozen short interviews with vendors from Xin Hua market. This market is a classical quasi-traditional Shanghai bazaar where things are cheap, hygienic standards low and many clients with low income. It is not a market place usually frequented by the new German car driving well off Shanghai middle class. The bazaar is not very busy and looks doomed to disappear sooner than later for some sky high real estate development like anything else in Shanghai with clean, proper sanitized market halls, not necessarily catering to the remaining low income residents of the neighborhood. The interviews are short and are all based around the question "How is business today?" as if in language class. 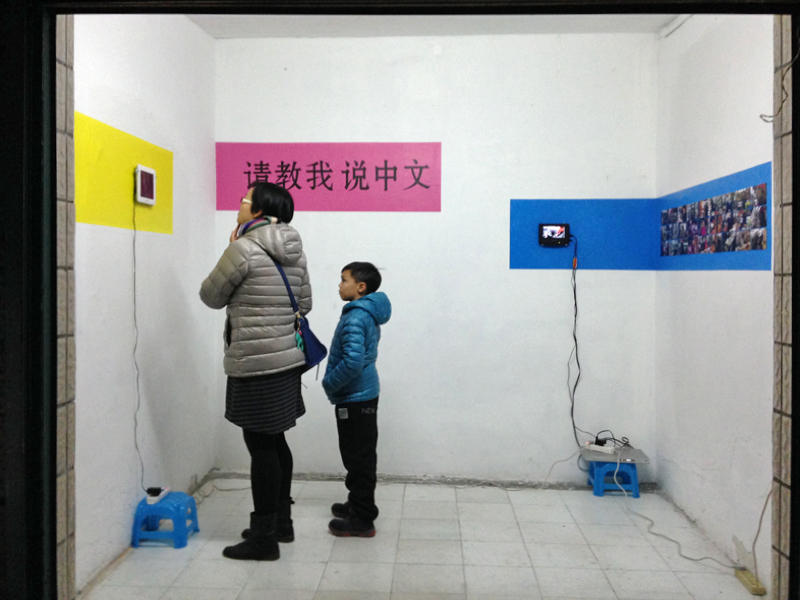 Like a reporter, the artist asks people about their business, their business history and their opinion about the bazaar. In certain instances personal questions were asked spontaneously. Surprisingly enough, a meat selling lady talks about her three kids in a place that imposes a one child policy. Two of her daughters are studying in US colleges something one wouldn't expect given the economics involved in such an operation that seemed not to be supported by her business model and the general environment of this low income market. 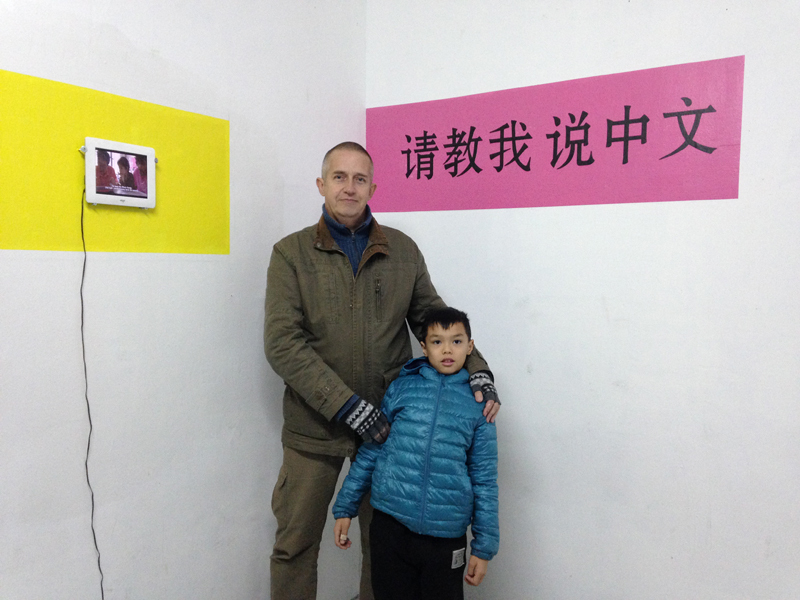 Ganahl, who is an autodidact and has been mostly learning Chinese on his own as part of his fine art practice conducted all interviews in his limited Chinese aided by his camera man Xu Meng who helped out when necessary.